Working in this field since 1991, Dr Sami Salem is a well-known senior surgeon who specialises in Laparoscopic Gastrointestinal and Bariatric surgery. 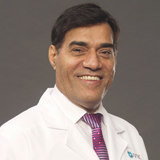 Dr Sami has performed more than 5,000 Bariatric (obesity) procedures such as Sleeve Gastrectomy, Omega Bypass, Gastric Banding, Roux en Y Gastric Bypass. He also has extensive experience in “Re-Do” or correction procedures after failed operations. Like Gastric Band, Sleeve Gastrectomies and other Bypasses. He is one of the pioneers of Sleeve Gastrectomy in Germany and Dr. Sami performs the Intragastric Balloon procedure endoscopically routinely. He is one of the first doctor to propagate the Intragastric BOTOX injections worldwide. Dr Sami is internationally well known for the treatment of the Ghastroesophageal Reflux disease and was the Head of the Specialised Gastric Center in Stuttgart for 10 Years. His secondary school and medical college was in Hamburg Germany. Specialization in General and Gastrointestinal Surgery was in Hamburg and London. He has a Doctorate of Medicine from Hamburg University and registered as a Consultant Surgeon in the London Specialist Register, UK and Stuttgart Medical Council, Germany. Dr Sami Worked for 5 years at Hammersmith Hospital, Ealing & Charing Cross Hospital and was examiner at the Imperial College, School of Medicine in London, UK. • German Society for Surgery. • Consultant Surgeon, registered in the Specialist Register U.K.
• IFSO, International Federation for the Surgery of Obesity. • German Society for Morbid Obesity Surgery.